Your vinyl fence is exposed to all of the elements during the cold and sometimes snowy Northern VA winter. Sure you purchased a vinyl fence probably in part because it’s generally low maintenance and also because it looks great, but that doesn’t mean you can just ignore it during the winter. Instead of letting your investment wear down throughout the harsh winter, take extra good care of it to ensure it lasts for years and years to come. Following these winter maintenance tips will keep your vinyl fence looking its best. With the freezing rain, sleet, and snow of harsh Northern VA winters, it is important to pay close attention to your vinyl fence to make sure the damage doesn’t become permanent. Using a solution made of white vinegar and water on a absorbent cloth will help get rid of those water stains and help restore your vinyl fence to it’s previous glory in time for spring. If water stains go untreated, it can often lead to water damage and mold. Especially with the sometimes-unpredictable weather of Northern VA, your vinyl fence is vulnerable for mold and lichen. Using the same solution as above, of vinegar and water, should help with the problem before it gets out of control. The key here is just keeping an eye on your vinyl fence throughout the winter to prevent the spread of water damage and potential mold. One of the greatest features of vinyl fences is their durability, but that doesn’t mean they are indestructible especially during harsh temperatures. Making sure there are no obvious defects like cracks or warping is essential in preventing further damage caused by cold temperatures and freezing precipitation. 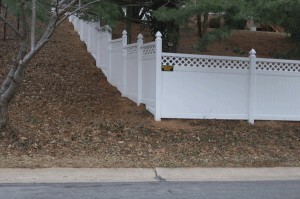 Want to talk to the Northern VA vinyl fencing experts? This entry was posted on Thursday, November 5th, 2015 at 6:11 pm. Both comments and pings are currently closed.